Classic case of hurry up and wait. The alarm went off at 4:45 so that we could get to the 7 a.m. jetfoil taking us to Pulau Bangka in plenty of time. However, between car trouble and entering a cellphone dead zone, our driver was so late that we finally lined up a hotel taxi. We had just pulled out of the driveway when Pak Herfendy's car appeared: a short and profitable journey for the hotel chauffeur, and a relief for us to reconnect with the young man who then expertly shepherded us through the ferry boarding process. Michael and our driver, who took his responsibilities very seriously. Our cheeky chappie porter. He took off with our luggage and our driver had me climb over the gangplank railing (jumping the queue) to follow him inside the ferry. Looking for somewhere to sit. An inquisitive neighbor. So well-behaved: he didn't peep during the voyage. Perhaps he was lulled to sleep by the in-cabin movie, "Resident Evil - Afterlife," probably the goriest film I've ever caught glimpses of. On the other hand, I'm sure these passengers did peep. We were accompanied on the voyage by crates of chickens. Bangka Island depends on the mainland for ayam and vegetables. I understand that the sandy soil isn't conducive to gardening, but I'm not sure why hens can't flourish. While I stayed with our baggage for the three-hour trip (up to eleven hours if not by jetfoil), Michael went up on the deck and captured this video of the Musi, complete with kids diving not for coins but for cartons of juice from our prepackaged ferry snacks. Disembarkation of chickens and people at Mentok, Pulau Bangka. Pak Herfendy had arranged for a taxi to meet us and the next driver was right there on schedule. We needed to be transported to the opposite coast to reach the resort where we were staying, the Istana (Palace) at Parai Beach, near the town of Sungailiat. The presence of a significant Chinese population was immediately evident. Most are descendants of coolies, brought in to work the tin mines. We drove through miles of open countryside, dotted with occasional hamlets. Here are some of the homes and shops we glimpsed from the window, generally characterized by clapboard and satellite dishes, most (despite evidence to the contrary in some of these photos) scrupulously tidy with neatly brushed dirt yards. Many buildings are sort of a cross between remnants of the Old West we saw in Colorado and sharecropper housing in the rural South. I suppose this is fitting, given that primary exports are tin (not gold and silver, but still a valuable mineral) and pepper (crop introduced by the Dutch when it looked as if tin mining was not viable in the long term). While the Chinese are Buddhist, Catholic, or Protestant, the dominant Malay/Indonesian inhabitants are mostly Muslim. It was Friday, the main day of prayer; I was too slow getting out my camera to catch the men in one town balancing their midday meals in bright-colored baskets on their heads. I've seen women do this in Jakarta, but never the male members of the family. We stopped to photograph durians growing high up on a tree and encountered a spider and web of significant dimensions. The next rare sight was a toko jalan (traveling store), the modern equivalent of a peddler. This one was selling mostly plastic goods, but the first one we spotted had an array of shirts and blouses for the discerning customer. Our journey was circuitous. Michael wasn't sure why we had to go via the capital, Pankalpinang, when the map showed a route straight through to Sungailiat, but Alan Smith's mantra, "There are many roads," proved correct. We got to Istana Pool Villas just in time for lunch. Our villa, with its own pool. Later in the afternoon I actually put on a bathing suit for the first time in years and had a nicely private swim. View over back wall. You can see why this resort has aspirations of turning Bangka into another Bali. Tenggiri bakar (barbecued mackerel). Bangka may not have its own poultry, but the Musi and the South China Sea provide great fish. Our meal was, shall we say, enlivened by a group from the oil company Medco indulging in a spot of karaoke. Someone has to be hard at work to provide this manicured perfection. Close-ups. Palms and an unidentified fruit. Bubbler crabs. See Michael's more detailed description and photos at http://throughthesandglass.typepad.com/through_the_sandglass/2011/07/tracks-trails-and-bubbler-crabs.html. The beach was "tattooed" all over with these little balls of sand. 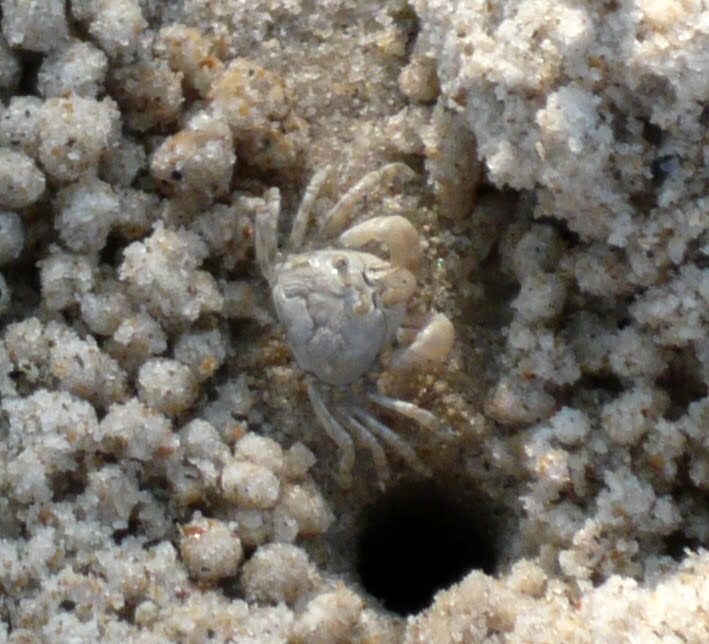 The crabs weren't the only ones playing with the pasir. Post beach, a swim and, for Michael, a gin and tonic. Or, as it happened, a gin and Green Sands, all that was available in the minibar. In the evening we had dinner on "the island" where a fish barbecue buffet was on offer — and yet more karaoke, this time c/o the local police association.